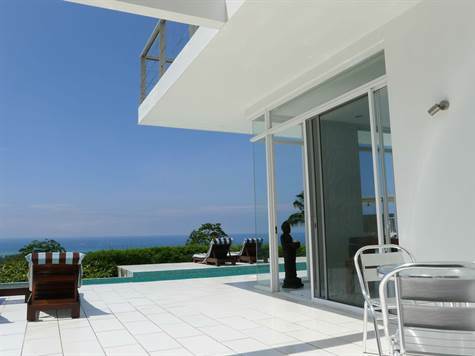 This is a two story Villa, three bedroom designer villa with sweeping views of Costa Ballena Nature Preserve, located on Costa Rica's Southwestern coast. Relax on one of Zen's private terraces, take a dip in the infinity pool, or simply relish the majesty that surrounds you. ZEN Villa is equipped with state of the art modern furnishings and facilities, complete with external living spaces fit for dining, relaxing and yoga. Situated just above Whales Tale National Park, this villa is just 7 minute drive from Pacific Ocean with ideal surfing, waterfalls, etc. Located in the jewel crown of Costa Rica, Uvita is located on the Costa Ballena, a small vibrant fishing village and the countries best kept secret on the entrance of the most dedicated national park, Parque Nacional Marino Ballena (National marine preserve). The Isla Bellena, also part of the National Park, is visited daily by an array of dolphins, monkeys and other wildlife. The beautiful beaches within the park sweep to a meeting point at Punta Uvita, The Whales Tail as it is known by locals.